The Notice to Employees (Workers' Compensation) Poster (Bilingual) is a workers compensation law poster by the Arizona Industrial Commission. This is a mandatory posting for all employers in Arizona, and businesses who fail to comply may be subject to fines or sanctions. This poster, written in both English and Spanish, must be posted in a conspicuous place where all employees will see it. The poster tells the rights that employees have to receive or choose to deny workers' compensation. It appears you don't have a PDF plugin for this browser. 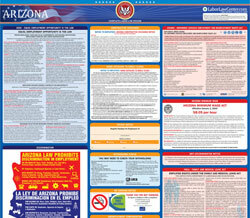 Please see the link below to download arizona-claims-poster-workerscomplawbilingual.pdf. employees at the office of this employer. disponibles para todos los empleados en la oficina de este patron. KEEP POSTED IN A CONSPICUOUS PLACE.